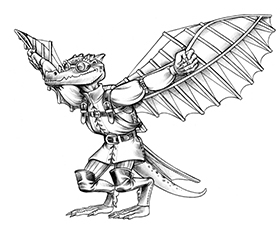 Down to 5 hp and fighting for your life against trolls, dragons, werebeasts, or worse? disadvantage your enemies before moving in for the kill. Unless the description specifies otherwise, all of the maneuvers in Beyond Damage Dice can be used by any character that’s wielding the appropriate weapon and is proficient with it. 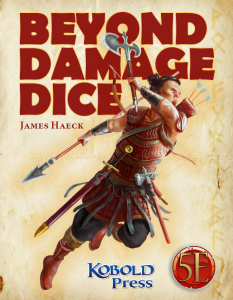 Beyond Damage Dice is now available in the Kobold Press store. The weapons table on page 9 is missing the stats for the Scorpion stiletto. The scorpion stiletto is identical to a standard dagger in all its stats on the table. The only difference would be price, but such a weapon won’t be offered for sale openly anywhere. If you want one, you must find a weapon smith who’ll make it or a disreputable dealer who’ll sell one under the counter, and the price must be negotiated in either case. I liked the posts so much I bought the PDF. You put all this effort into making all sorts of cool maneuvers and weapon options. 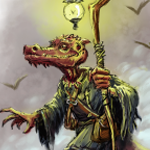 …and there’s nothing for whip wielders? !